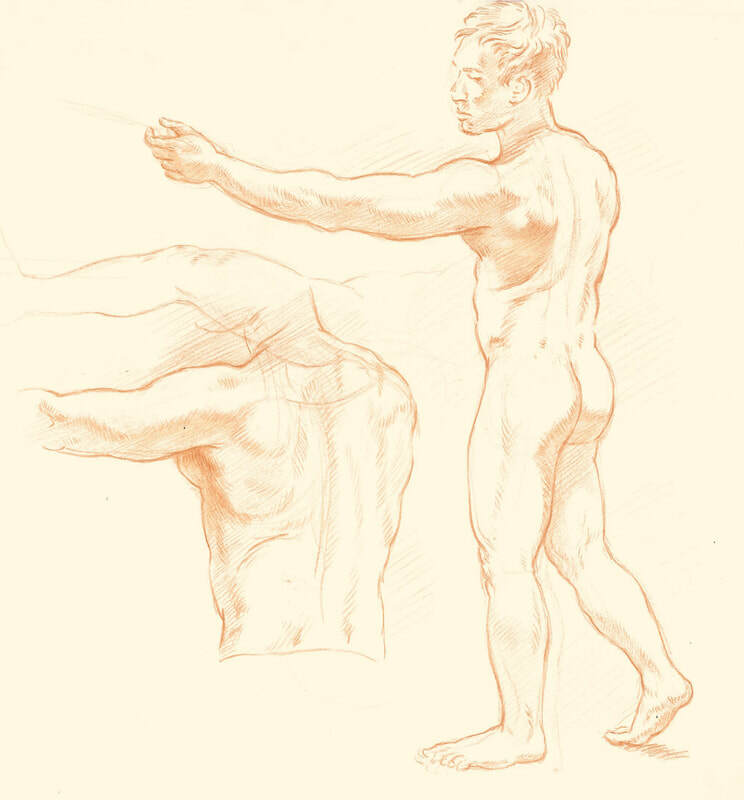 This course seeks to systematically outline and guide you through, some of the fundamental principles that lead to a comprehensive proficiency for drawing the human figure. In the space of six weeks students will gain the necessary tools in a short time, to build on principles they can practice and repeat over a life time. Each week introduces the student to a new aspect of competent figure drawing. Included with this is a brief analysis of human anatomy, starting with the major masses of the skeleton and concluding with an analysis of each of the major muscle groups of the human body. Week 1. The figure as basic line and structure. Week 2. The figure as line and structure. Week 6. The figure as convexed forms, basic shadow masses and modelling at the plane break. Identify how the placement of the models weight coincides with the figures action. Begin to understand and grasp the processes of conceptualising, selecting and creatively inventing from the figure. Learning how to treat the figure as a “mannequin” rather than a static object to mindlessly copy and reproduce. Have an ability to apply a basic knowledge of human anatomy to figure drawing, including the basic skeletal masses of the figure and muscle groups. Making use of and/or inventing a light source to model form. Being able to identify techniques and make use of Old Masters drawings within a contemporary drawing practice. Faber Castel Pitt oil based hard sanguine OR black chalk pencil.